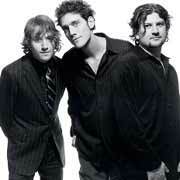 When you go to a Ben Taylor Band concert, you may not get their autograph, but they will probably get yours! After a concert, (and they will be starting soon, to promote their new album "Another run around the Sun") the band members pull out their Treo 600's and start swiping! "Merchandise sales are probably about half of our income right now. It's critical to be able to sell things at the shows," says Larry Ciancia, Ben's drummer, in an interview with Mobility Magazine. "We used to turn away a lot of people that didn't carry cash to the show, and so we lost a lot of sales opportunities." "We used to see other bands with the ability to take credit cards and print receipts right on the spot, and we were definitely jealous," said Dominic Keska, the band's merchandize coordinator, in the same interview. "Now we don't have to deny sales to folks that don't carry cash." Amy Tangerine is redefining fashion with her unique line. Nominated as Atlanta's New Cultural Icon for Fashion by GenArt, and carried by boutiques from New York to Tokyo, Hong Kong to Newport Beach, these fashions are taking the world by storm! Amy Tangerine herself uses a Treo 650 and Pocket Merchant at trade and fashion shows. She says" It is so easy to work with your company because of the exceptional customer service. Since this technology is so advanced and affordable, it is comforting to feel like we can always contact you with any concerns or questions. Every customer is impressed with the ease of running their credit card. I am such a big fan and I have made sure to spread the word to fellow small business owners in the fashion industry. Our business is small but growing, and we are always excited to have a great team of professionals helping us along." You can visit her at www.AmyTangerine.com where she is premiering her new children's line: Tangerine Dream. You can also see the sites and boutiques where her line is available! Hometown Fireworks Inc., is one of our seasonal businesses that uses our wireless technology to get swiped transactions anywhere. They use our Treo 300 and Pocket Merchant package for their fireworks stands. Brad Thomas, president of Hometown says: "I will start out by saying that if more companies had customer service like Advanced Merchant [Merchant Anywhere] does, it would be a happier world we live in! Their people are FANTASTIC! They totally went out of their way to help me over the hill. Far and away the best product on the market today! So easy to use, I have 13 units in the field for 10 days of the year. The people running the machines aged from 18 to 74 years old had zero training and it was a breeze! " Hometown Fireworks Inc. would recommend this product/service to any mobile person or company out there today with full confidence. They receive a 10 in my book!" With the start of summer this merchant certainly hits the spot! Mistcooling.com is a leader in outdoor and indoor mist cooling products and mosquito go-away system for home owners, commercial and industrial applications. MistCooling.com says: "We have started accepting credit cards with MerchantAnywhere.com, and now we realize we had lost about 40% of business by not accepting credit cards before." Greg Lawler of Greg Lawler's Art Fair Sourcebook says: "I now use the "Pocket Merchant" swiper/printer with my Treo smart phone for all my art sales and AFSB transactions. I've been using them for six months and can endorse this product and service without reservations. Merchant Anywhere has created a very user friendly interface and their equipment works flawlessly. I find it VERY convenient to use, both in my booth and out on the street. If you can get a cell signal, with Merchant Anywhere you can get an authorization and print a receipt ... it's as simple as that. The tech support is excellent and friendly, with calls returned quickly and reliably. I LOVE the online tracking of all my transactions, no matter how old they may be. This is the easiest system I've used to date, and I'm very pleased to recommend it to my AFSB clientele. You won't be disappointed." PDAPhoneHome Here! The world of merchant accounts can be a very confusing world if you are just getting involved with them for the first time, and looking to add credit card processing to your small business. There are many different components and fees you have to deal with, and your overall costs can vary greatly depending on which path you select. The fees and costs can even vary depending on whether you do a lot of of little transactions, or a few big transactions. I have been using merchant accounts for several years now and have believe that MechantAnywhere is one of the best alternatives for mobile transaction processing. There are other vendors out that use dedicated mobile terminals that either process the transactions in batch when you return to your office, or are very expensive. If you are visiting PDAPhoneHome.com, then you likely already have a PDAPhone, and with MerchantAnywhere, you can turn it into a very slick credit card processing device. 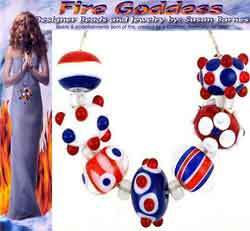 www.Firegoddess.com creates glass bead jewelry and is featured in magazines like Bead and Button magazine and offers their unique and exciting jewelry to the public at shows and online. The artists' husband and business manager says: "Susie and I are asked daily about the wonderful little credit card processing unit that we use from: Advanced Merchant Solutions. This is a fantastic product that allows little companies like Fire Goddess to travel and still have rapid and secure credit card transactions. It is also perfect for any size company or operation that requires a fairly priced efficient merchant solution. Advance Merchant Solutions is one of the least expensive alternatives we have discovered and when you add in the value of error free operation, nationwide access both inside a building as good as outside reception, Merchantanywhere.com is your best choice and receives our highest recommendation and endorsement. Fire Goddess has used Advanced Merchant Solutions service and products for years now and we still talk to the founder on the phone whenever I have a need or question." Salome's Tent offers belly dance costumes and accessories. They provide a full range of items, covering all the major dance styles. Patsy H. of Salome's Tent loves our PC Verifier technology: "The small swiper is easy to use either at my shop or at shows. At shows I take a small laptop and my swiper, and use my cell phone as a modem to get an internet connection, so I can be wireless very easily. I am also exploring adding a PDA application as an alternative to using the PC at shows. Since I also sell online, I use the PC input screens extensively to input online credit card sales." Business Management Group, Inc. is a diversified consultancy that specializes in engineering, marketing, and management. BMGI prides itself on its ability to offer practical solutions to diverse problems. We learn the details of each client’s business in order to provide realistic recommendations that lead to tangible results. 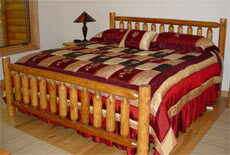 We emphasize quality and guarantee customer satisfaction with our work. Asim Khan says: "Thanks to Merchant Anywhere, BMGI has been able to strengthen relationships with its customers and improve cash flow.. If it weren't for MerchantAnywhere, BMGI could be losing significant sales and profit to competitors"
We at MasscashSales.com www.detailbest.com sell high quality car care products and BMW parts, accessories, and lifestyle items. During the spring and late summer/fall we sell live at a number of outdoor auto shows. We're running now and extremely pleased! Over the past several weeks I sent you 14 separate E-mails ranging from requests for product information to support. All were answered promptly. Sometimes we wonder if you ever sleep! 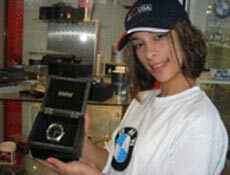 Roger Chartier of MassCashSales says: "To be fair there were issues with the Palm phone I picked up on eBay that required a total of 5 hours spent on the phone between Cingular and Palm until they were finally solved. Today with Pocket Merchant we captured two sales from individuals that wanted merchandise but were short on cash. This is a welcome addition to our bottom line and an additional opportunity to serve our customers. Customers are fascinated with the MerchantAnywhere technology, and enjoy interacting with the authorization process while outdoors! You and MerchantAnywhere exceeded my expectations. A number of business people have been paying close attention to my undertakings and they will be informed of the very positive results! As for other business people, if you're looking for an organization that will be there for you when the chips are down, help you through your difficulties, and also provide you with timely E-mailed newsletters.... MerchantAnywhere is for you." Reed Wells, of MajikMushroom says: "Merchant Anywhere was the first merchant account I ever used. With the excellent service that Dennis and the crew provide, it will also be my only one. Thanks very much guys!" David B Turetsky, owner of BusFish says: "For merchant services, their rates cannot be beat. BusFish switched to MerchantAnywhere due to their customer support, prices and outstanding technological offerings." Sue Dallmann, owner of A Path to Wholeness says: "[I] Just wanted to tell you (again) how pleased I am with your company. I just finished exhibiting at the International Gem & Jewelry Show in Chicago over the Memorial Day weekend & witnessed several other vendors taking their larger & cumbersome credit card machines over to the windows trying to chase a signal while I sat there in my booth with my Palm & Verifier Pro processing payments without a glitch. What a relief that was." They use a Treo 600 with Pocket Merchant at events and expos, using Pocket Verifier for the credit card sales, and our Pocket Change software for their cash sales. Dr. Anthony R. Ellis, M.D., founder and author writes us: "Just wanted to say thanks for a great product. I am an author and sell my books at local events/expos. I made $3000 worth of sales in the first week the book was available and $350 of sales came via credit card transactions. Your company and you product functioned flawlessly and the funds were in my account within 24 hours. Thanks again. By the way, many other merchants asked me about the product and I've referred them to your website." 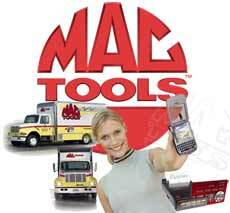 MAC Tools has adopted Pocket Verifier company-wide, and even teaches how to use at their Training Center. At Mac Tools Corporate, the "Mobile Merchant" coordinator, Dario Dinardo, MAC Card Specialist says: "One of my responsibilities is to help our fleet of distributors who are interested in purchasing a mobile credit card machine, to do so. The program we have in place has our merchant accounts set up through MerchantAnywhere. [Our Rep] has been a vital link in our process pipeline. Any questions or concerns that do arise, from starting up a merchant account, to fixing glitches that happen to pop up from time to time, are either answered to or taken care of quickly and clearly by [Our Rep]. The professionalism displayed by merchantanywhere is first class all the way, I recommend them highly." 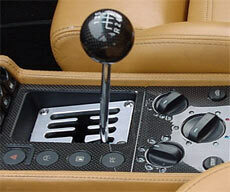 makes and markets high end carbon fiber interior products for Porsche, Ferrari, and Lamborghini automobiles. John Borchelt of MACarbon writes: "We have been using MerchantAnywhere for our credit card processing for the last year after starting out taking PayPal. We use the Pocket Merchant with a Sprint TREO 300 at tradeshows. This arrangement was our original reason for signing up. We also use the internet terminal [Transaction Central] to do our daily phone sales. It has been great working with you to service our customers." Drachenstein Treasures, at www.dragonsjewels.com specializes in jewelry, medieval clothing, Crowns, coronets, and decorative metalwork. The crowns are really impressive, I would consider wearing one here in the office, but I fear my "Subjects" would revolt! Frank D., the owner of Drachenstein Treasures took our system in the field and says: "Just finished our first show using the Pocket Verifier - absolutely no snags - perfect coverage. The show was in the Katrina damage zone where they had replaced all the towers with the new digital towers, our old analog system would have cost us a mint. So many merchants found their old systems worthless and ended up either voice authorizing their sales or gambling with the manual imprinter...Your system teamed with a Treo 650 is a power house. It was also great not having to walk about, like other merchants, holding a Nurit in the air like the Statue of Liberty looking for a signal, or having to do voice authorizations on your cell phone - and being charged for it. I couldn't be happier - Thanks!" For travel and emergency water supplies, look to HealthyWaterProducts.com. After a disaster, the first thing that FEMA and the emergency services bring into a disaster area is fresh water. Often, that takes days and days, and people are forced to drink from questionable sources, increasing the level of disease and misery. Besides being useful on a camping trip, one of these inexpensive units could really help if your area should suffer an interruption of potable water. It's owner, Jack Slocumb selected MerchantAnywhere especially for this account. Jack is actually one of the original authors of the Transaction Central gateway! Being in this position, he had his pick and choice of hundreds of companies that use that gateway. Jack says: "Because you cut out the sales reps and deal direct to the merchant, you have eliminated the greatest markups. All the other guys want 2 year commitments and cancellation fees, and I know from experience that they would not give me service after the sale"
This is Jack's SECOND account and company with us, and he continues by saying: "Your online merchant application make it so simple to get my merchant account that I was shocked. In 2 days I was setup and ready to take transactions with my own shopping cart. It was so easy to integrate into my shopping cart system"
opyright © 2001 Advanced Merchant Solutions, Inc. All Rights Reserved. Merchant Accounts offered with our software products are provided by TransFirst, a registered Independent Sales Organization, in association with Key Bank. All artwork, logos, Pocket Verifier, PC Verifier, nSwipe.com, Card Collector, WapVerify, PCDebit.com and MerchantAnywhere.com are trademarks of Advanced Merchant Solutions, Inc.